Ceramic Fiber Cloth contains a certain amount of binder material which is normally burned at lower temperature and does not affect the insulation property. 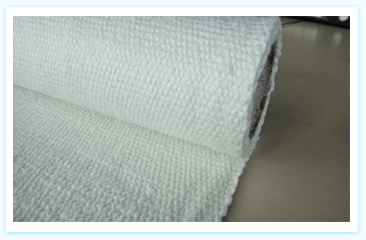 Ceramic Cloth is a woven fabric made from our high quality alumina silica fiber and especially mechanically needled for increased tensile strength and surface integrity in form of ceramic fiber yarn. It can be used for high temperature applications up to 2300 F. The cloth is reinforced with fiberglass filament, and optional Inconel/alloy steel wire. Ceramic fiber textiles (cloth, tape and rope) contain a certain amount of binder material which is normally burned at lower temperature and does not affect the insulation property.